Westville Fire Department will be conducting fire prevention activities throughout the month of October. We will be visiting Parkview Elementary School in the near future, as well as the local day care centers. 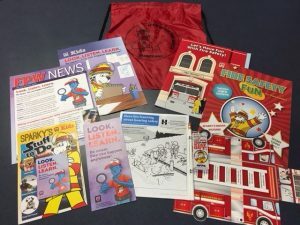 Firefighters will be delivering fire safety packets that contain safety material and children’s activities to all students. Please review these packets with your family when they come home. Firefighters will also be present on October 30th at the Klinger Avenue ball fields for a Public Safety Night. Fire Prevention material will be distributed at that event also. Times for the Public Safety Night will follow shortly. If you are a Westville resident, and would like additional fire prevention material. Please contact the Fire District Office (856)456-9432 or wfdfm@westvillefd.com to request these items. Supplies are limited.